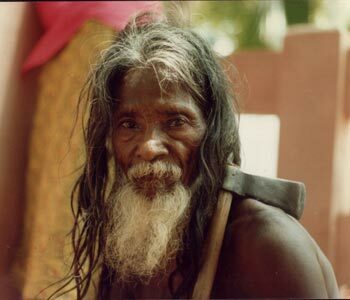 Sri Lanka's aboriginal inhabitants, the Veddhas, are truly a fascinating people. Descended from the country's stone-age inhabitants, these primitive folk cling tenaciously to their age-old life-style by living off the hunt and gathering the fruit of the land, despite the ongoing process of industrialization and modernization. The Veddhas are proud of their distinct sylvan heritage and call themselves Vanniyalette, 'those of the forest'. The term Veddha, by which their Sinhalese neighbours denote them, comes from the Sanskrit vyādha meaning hunter with bow and arrow. The pure Veddhas, unlike the Sinhalese who speak an Indo-Aryan language and claim Aryan descent, are related to the austro-asiatic peoples found scattered today in many parts of southern Asia. 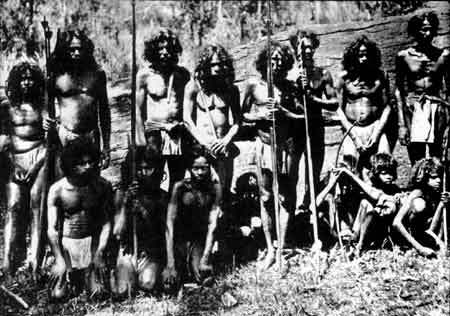 These include the aboriginal tribes of Chota Nagpur in eastern India such as the Hos and Birhors, the Sakai of Malaysia, the Kubu of Indonesia and the Australian aborigines. A dark, chocolate brown complexion, long head,broad nose, heavy brow ridges, wavy hair and a pronounced prognathism arecharacteristic of this sort of people. The hunter-gatherer mode of existence is also common to all of them. The pure Veddhas are today a numerically insignificant community comprising a few hundred souls at most. The last census, which enumerated the Veddhas as a separate community was conducted in 1953. It showed a total of 803 Veddhas. Until fairly recent times, Veddha settlements were to be found scattered in the Uva, Sabaragamuva, North-Central and Eastern Provinces. Such areas like Nilgala in the Eastern Province and Yakkure in the North-Central Province had a considerable settlement of Veddhas. However, linguistic assimilation and intermarriage with their Sinhalese neighbours have contributed to the decline of the Veddhas as a distinct people and today Dambana, a Veddha settlement about six miles from Mahiyangana, is the last bastion of Veddha culture. The Veddhas, once a numerically strong people, have been declining steadily during the last 2,000 years of their existence, due to assimilation with the Sinhalese. Indeed, these sons and daughters of the soil have contributed to the formation of the Sinhalese nation in no mean measure. Professor Rudolph Virchow in his contribution on the Veddhas to the Royal Academy of Science of Berlin (1881), concludes following a detailed historical and anthropological study, "manifold resemblances exist between the Veddhas and the Sinhalese,Ó and that "the origin of theSinhalese race from a mixture of Veddhas and immigrants from India possesses great probability. Dr. Senarat Paranavitana (Inscriptions of Ceylon 1970) cites epigraphic evidence to show that the Veddhas and Sinhalese coalesced to form one people,Ó in the course of time. R.L. Spittel (Wild Ceylon 1924) also comments on this large-scale intermarriage between Sinhalese and Veddhas. According to the ancient chronicle of Sinhalese royalty, the Mahavansa, the Pulindas (Veddhas) are descended from Prince Vijaya (6th-5th century BC) the founding father of the Sinhalese nation, through Kuveni, a woman of the Yakkha clan whom he had espoused. The Mahavansa relates that following the repudiation of Kuveni by Vijaya, in favour of a Kshatriya princess from the Pandya country, their two children, a boy and a girl, departed to the region of Sumanakuta (Adam's Peak in the Ratnapura District) where they multiplied giving rise to the Pulindas. 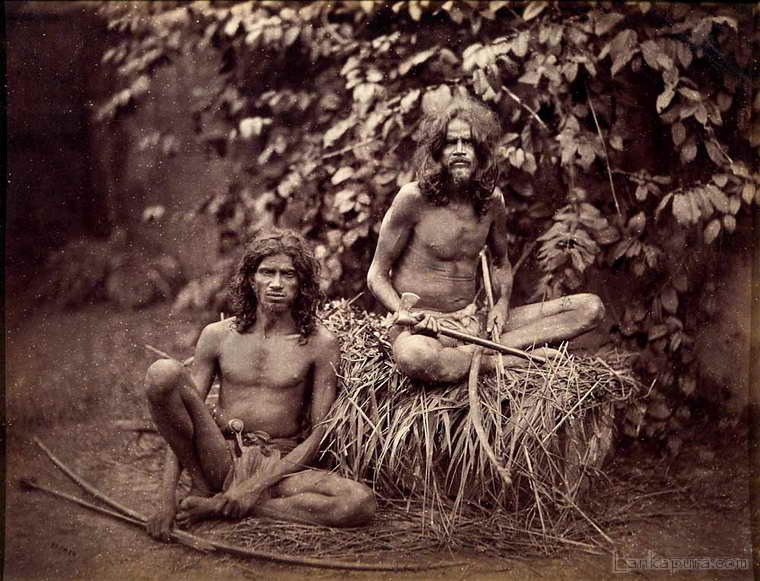 Anthropologists such as the Seligmanns (The Veddas 1911) believe the Veddhas to be identical with the Yakkhas of yore. The Ratnapura District, which is part of the SabaragamuvaProvince is known to have been inhabited by the Veddhas in the distantpast. This has been shown by scholars like Nandadeva Wijesekera (Veddhasin transition 1964). Indeed, the very name Sabaragamuva is believed to have meant the village of the Sabaras or forest barbarians. Such place-names as Veddha-gala (Veddha Rock), Veddha-ela (Veddha Canal) and Vedi-Kanda(Veddha Mountain) in the Ratnapura District also bear testimony to this. As Wijesekera observes, a strong Veddha element is discernible in the population of Veddha-gala and its environs. As for the traditional Veddha lifestyle,a number of authorities have delved on this and we can easily describetheir life-style as it existed in the past, and as it exists today. Veddhas are known for their rich meat diet. Venison and the flesh of rabbit, turtle, tortoise, monitor lizard, wild boar and the common brown monkey are consumed with much relish. The Veddhas kill only for food and do not harm young or pregnant animals. Game is commonly shared amongst the family and clan. Fish are caught by employing fish poisons such as the juice of the pus-vel (Entada scandens) and daluk-kiri (Cactus milk). Veddha culinary fare is also deserving of mention. Amongst the best known are gona perume, which is a sort of sausage containing alternate layers of meat and fat, and goya-tel-perume, which is the tail of the monitor lizard (talagoya), stuffed with fat obtained from its sides and roasted in embers. Another Veddha delicacy is dried meat preserve soaked in honey. In the olden days, the Veddhas used to preserve such meat in the hollow of a tree, enclosing it with clay. Such succulent meat served as a ready food supply in times of scarcity. The early part of the year (January-February) is considered to be the season of yams and mid-year (June-July) that of fruit and honey, while hunting is availed of throughout the year. Nowadays, more and more Veddha folk have taken to chena (slash and burn) cultivation. Kurakkan (Eleusine coracana) is cultivated very often. Maize, yams, gourds and melons are also cultivated. In the olden days, the dwellings of the Veddhas consisted of caves and rock shelters. Today, they live in unpretentious huts of wattle, daub and thatch. Veddha religion centred round a cult of ancestral spirits known as nae yaku, whom the Veddhas invoked for game and yams. Today, however, many Veddhas are Buddhists like their Sinhalese neighbours. The Veddha marriage ceremony is a very simple affair. The ritual consists of the bride tying a bark rope (diya lanuva)of her own twisting, around the waist of the bridegroom. This is the essenceof the Veddha marriage and is symbolic of the bride's acceptance of the man as her mate and life partner. Although marriage between cross-cousins was the norm until recently, this has changed significantly, with Veddha women even contracting marriages with their Sinhalese and Moor neighbours. In Veddha society, woman is in many respects man's equal. She is entitled to similar inheritance. Descent is also reckoned through the female line. Monogamy is the general rule, though a widow would be frequently married by her husband's brother as a means of support andconsolation. Divorce hardly ever takes place. The women are said to make faithful wives and affectionate mothers. Death too is a simple affair sans any ostentatious funeral ceremonies and the corpse of the deceased is promptly buried without much ado. Although the medical knowledge of the Veddha is limited, it nevertheless appears to be sufficient. For example, python oil (pimburu tel) a local remedy used for healing wounds, has proven to be very successful in the treatment of fractures, deep cuts and so on. Until fairly recent times, the raiment of the Veddhas was remarkably scanty. In the case of men, it consisted only of a loincloth suspended with a string at the waist, while in the case of women, it comprised of a piece of cloth that extended from the navel to the knees. Today, however, Veddha attire is more modest, men wear a short sarong extending from the waist to the knees, while the womenfolk clad themselves in a garment similar to the Sinhalese diya-redda which extends from the breastline to the knees. The original Veddha language has to all intents and purposes ceased to exist and survives in a few words and phrases they use in their everyday conversation. The Veddha language today is a curious hotch-potch of modern Sinhala, old Sinhala and a non-Aryan speech which would have constituted their original tongue. This unidentified language may perhaps have contributed to the formation of the Sinhala language, which, although Aryan, containsa large vocabulary of non-Aryan and non-Dravidian words that have perplexed linguists. 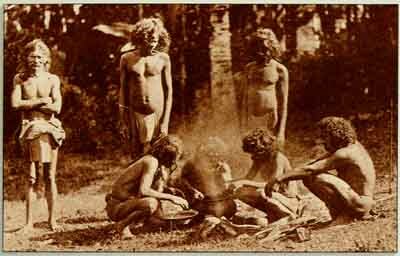 Robert Knox, an English exile in the Kandyan kingdom for nearly twenty years (1660-1679) says in his Historical Relation of Ceylon (1681):"In these woods there are wild beasts, so wild men also... they call them Veddhas, dwelling no other inhabitants. 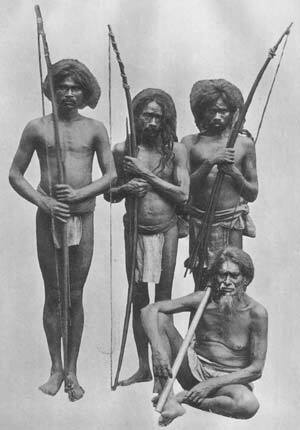 They speak the Chingulayes (Sinhalese) language,Ó so that even during Knox's time, the Veddhas could converse in Sinhala. Even the old Veddha names such as poromala (male)and tuti (female) have gone out of vogue; Kandyan Sinhalese names like Tikiri Banda (male) and Dingiri Menika (female) have become popular. R.L. Spittel has written a wonderfully informative book (Vanished Trails: The Last of the Veddas 1950) based on his adventures and experiences with three generations of Veddha folk. The book deals with the progressive loss of the traditional Veddha life-style and culture. The Veddha's honesty, sincerity, compassion, marital fidelity and sense of duty to the family and clan are lofty ideals and have been commented on by various observers and scholars. They are indeed the unspoilt children of nature. One might ask if they do not epitomize the concept of the Noble Savage that was the subject of much 19th century European romanticism.